Well, that was a lovely hibernation. 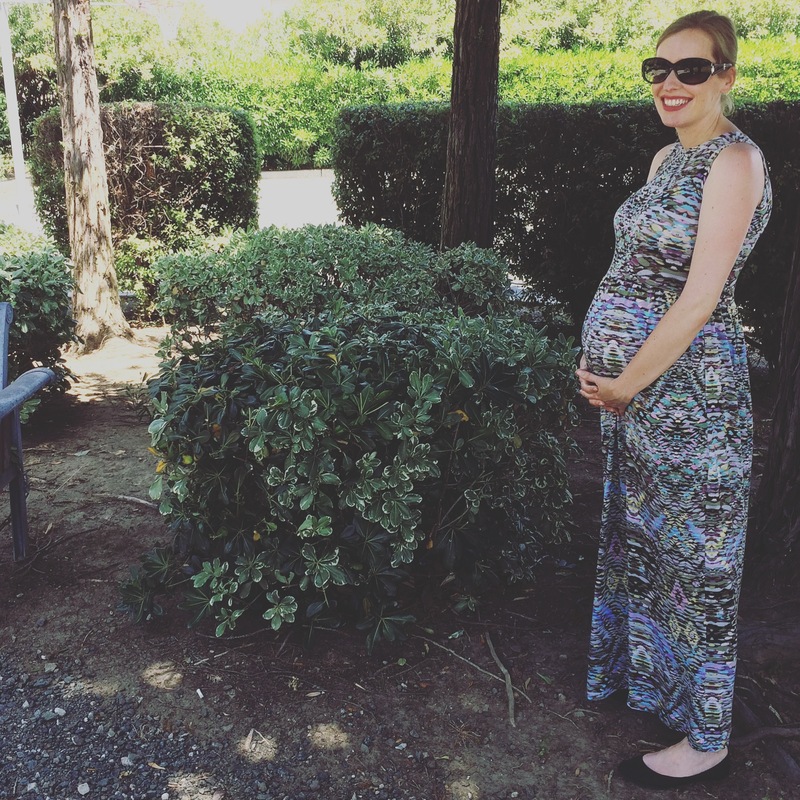 I moved, started a new job, and… well, wound up pregnant. 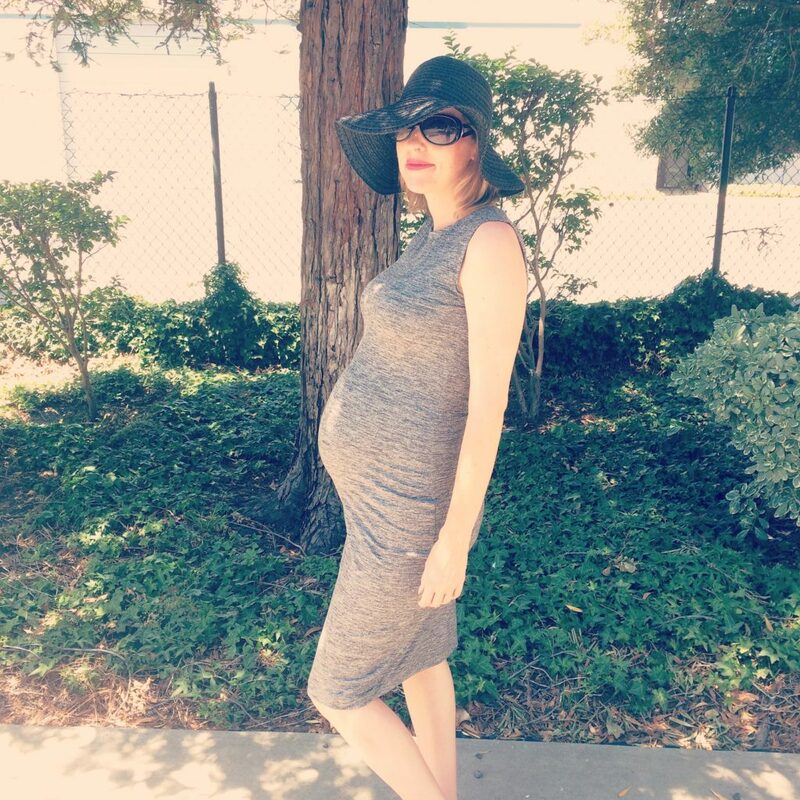 And now it’s summer, I’m just about due, and I wanted to share some of my maternity makes for posterity. It’s funny — pretty much from the moment I found out the news, I lost the desire to sew. Like, completely. I mean, I still haven’t finished that amazing brocade jacket I cut out back in November and was super excited about. I had the time, and some days the energy, but man, the desire? That was so gone. My sewing hobby has definitely been off and on through the years, but I’ve never had such an abrupt “off” period. Then I hit 20 weeks, got a bit of energy back, and sewed myself a mini maternity wardrobe, using pretty much just McCall’s 6886. When I wrote about this basic knit dress back in November (a lifetime ago, people! ), I was excited about how well the pattern could function as a block, ready for customizations and hacks. I just love being right. Once I got the itch to sew, it hit hard, and I went right to work! I made a couple of pieces not from this pattern, and I think I’ll cover those later. Let’s start with the first hack, in which I turned 6886 into a basic maternity dress. The beauty of this pattern is the lack of extraneous details, which makes tweaks super easy. I just cut the front length about 8-10″ longer than the back, gathered the extra front fabric to the back at the sides, and BOOM! 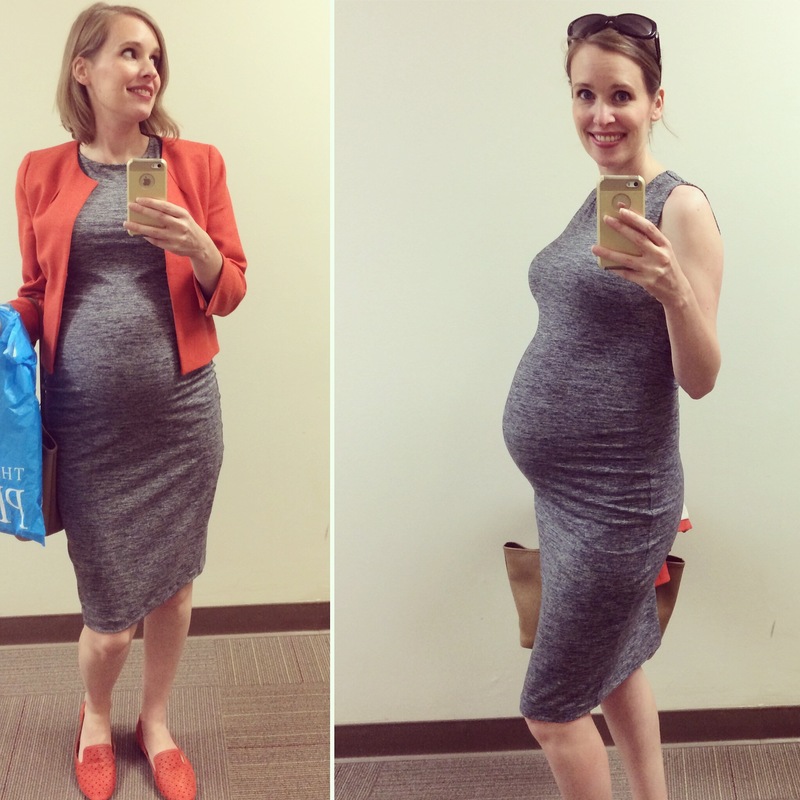 Instant maternity dress. The fabric is a scuba knit from Joann’s in the most perfect shade of emerald green. I imagined sewing this up and wanting to wear it every day, forever. I do love it, but there are a few catches. The biggest is that the scuba knit performs differently than I expected. Whereas I thought the thick, spongy fabric would cover up lines and lumps, it most assuredly does not. 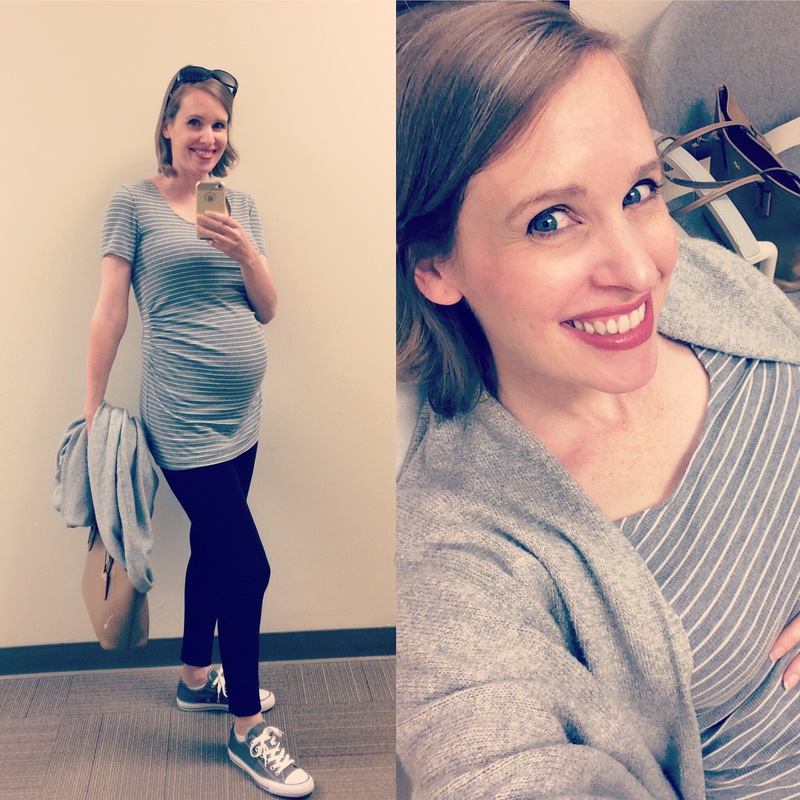 I love my bump being on display (seriously, I’m a creepy out-of-control bump-rubber), but my bra straps and underpinnings? Not so much. But that’s the only strike — all else is right with this dress. I especially love how a basic zig-zag stitch looks natural and fun on this fabric — making necklines and hems super fast and easy. 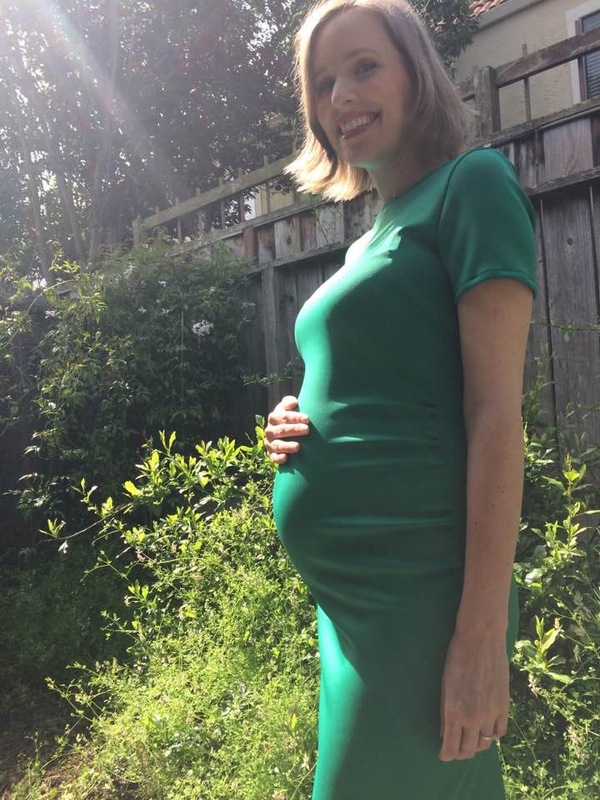 So, I pushed my luck and used the same extra-long-front-gathered-at-the-sides technique to make a bodycon maternity dress from stretchy athletic fabric. Love this one! It can be casual, or work appropriate, and is great for fluctuating spring temperatures. Plus, it came together so quickly and easily — this was truly a “make it in the morning, wear it in the afternoon” type of project. Hey, a dress worked, so why not a tee? I used the same pattern and technique to make a cute maternity top that was long enough to allow me to wear leggings in public. (Because I’m not living without my leggings right now. Not happening.) I just eye-balled the neckline to lower it. The neckline curve ended up a little deeper than I envisioned, but who cares? Not me right now. Also, I accidentally cut the front shorter than planned and had to patch a strip back on. Again, who cares? And again, not me. This tee is pretty boring, but I wear it a lot because I made it to fit exactly what I needed from a tee. Sewing win! Complete with doctor’s office selfie because #legit. Also, I wasn’t sure how much skirt I wanted, so I cut the rectangles extra wide — probably about 28″ across on both the front and back. Too much — I ended up taking the sides in a couple of inches on each side. It’s an easy fix, but there were definitely more “try it on, check the mirror, repin, baste, and try again” iterations than I hoped for. I love it so much I wore it to the baby shower and was comfy *all* day! All of these makes have been surprisingly enjoyable. I took a sharp right turn from my usual, “Buy a pattern, follow the instructions, and inevitably get frustrated somewhere along the way” type of sewing. I decided that I was going to wing it on everything and be okay with the results, whether they were what I envisioned or not. I gave myself permission to just play, and screw things up, and be okay with that, in the interests of not feeling stressed. I also gave myself permission to not sew any maternity clothes at all. Working with ridiculously simple shapes and forgiving stretchy fabrics really facilitated my “no-stress sewing” goal. I’m glad I have a bit of perspective after sewing for years — at least enough to know what would be biting off more than I can chew, what corners can and should be cut, and how to make things easy on myself where possible. Sometimes the hard-earned knowledge is not a fancy technique or perfected process, it’s the ability to ruthlessly streamline and still get what you want. Thanks for reading — I’m glad to be back in the mix, at least for the moment! So gorgeous mama! Love reading your blog posts! Thanks, lovely lady! 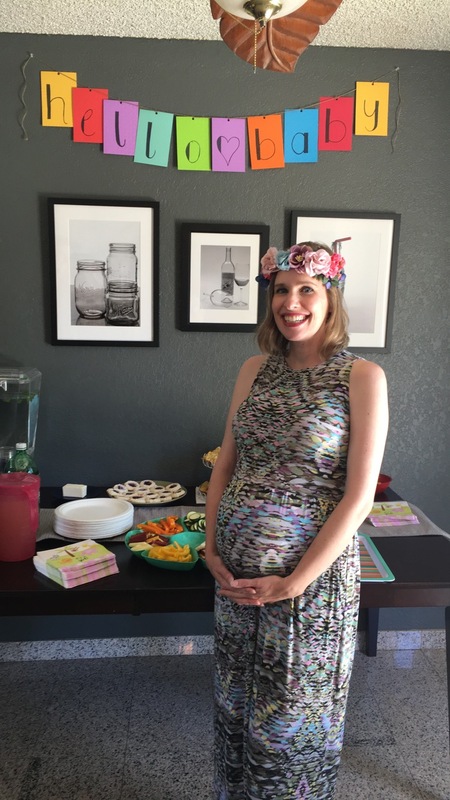 You get all the credit for the huge smile on my face in the baby shower pic. Can’t wait for you to meet her!